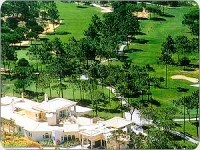 Pinheiros Altos course is considered one of the best courses along the Algarve and is located within the well-known Quinta do Lago resort. For most experienced golfers this course is known for its challenging strategically placed hazards. 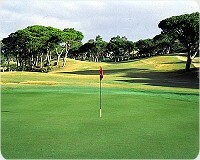 The fairways are generous and the outward nine-holes are played through attractive a pine forest. 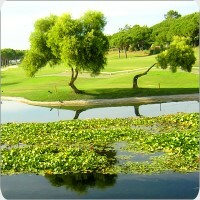 The back nine holes is when the play is more demanding and brings many water hazards into the game. 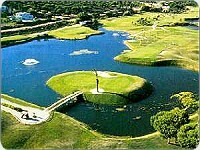 A very attractive hole is the 17th with its peaceful inviting green which sits on an island surrounded by a lake. Via Infante (A22) - Take Airport Exit-13 and head south past Football Stadium on the right. About 1 km further bear right to Almancil up a small slope just before you reach the fly-over which is the Road EN 125. Follow the traffic stream to the west but bear to the right directly after São Lourenço onto a flyover which takes the driver into Almancil. Move to the right hand lane when you see the traffic lights. At the second traffic lights turn to the left and follow the road south (after approx. 300 meters the road divides - take the right hand fork). Drive south to a T-Junction. Turn turn left to Quinta do Lago Area Courses. After passing the Shopping centres on the right side there is a roundabout - here you take the turning off to Pinheiros Altos and not into the main Quinta do Lago Resort. Continue ahead for about 1 km and this will bring you to the course.